A quintessential summer treat, nothing quite beats the smell of freshly picked strawberries. And it’s no wonder why they smell so delicious – did you know they’re actually a member of the rose family? This succulent, fragrant fruit is as beautiful as it is flavourful. Rich in vitamin C, Manganese and folic acid, strawberries are a good source of ellagic acid and contain antioxidant flavonoids linked to protecting the body against heart disease, stroke and cancers. Health benefits aside, strawberries make a great addition to any summer dish. Whether you’re adding them to a salad, freezing them to replace ice cubes in a seasonal cocktail, or whipping up a fresh vinaigrette of your own – strawberries are an easy way to add a pop of flavour and colour to any of your meals. This month I’ve once again turned to Chef Nicole to share with us her favourite way of incorporating strawberries on to The Bookshop’s menu. 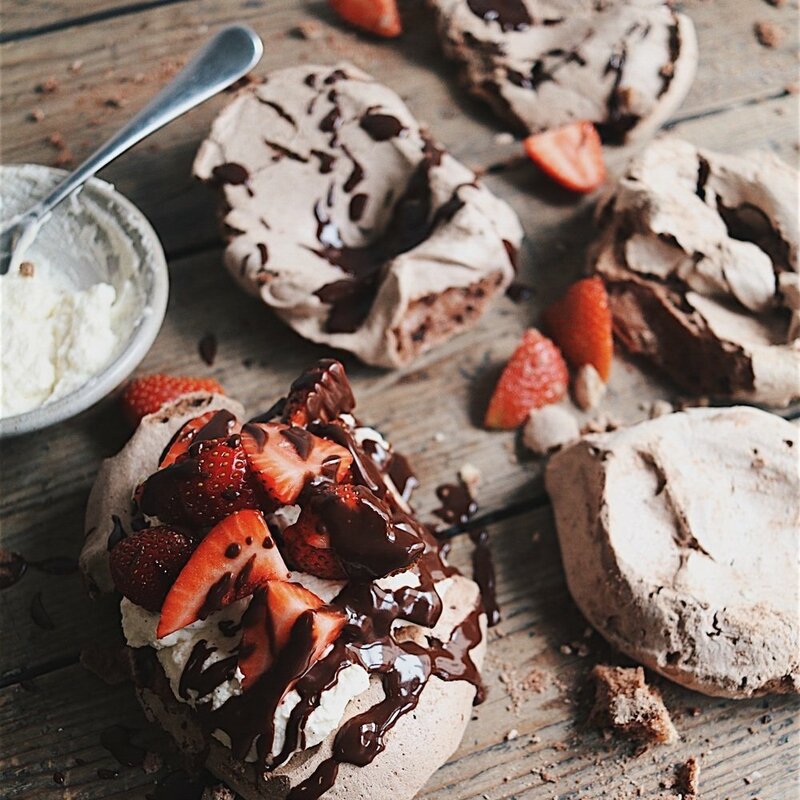 Chocolate Pavlova with Strawberries and Vanilla Cream – a simple, light treat perfect for al fresco summer dining. For best results, I would use a stand mixer, as it can do the hard work for you! Whip the egg whites until stiff peaks form, then keeping the mixer going adding only a tablespoon of caster sugar at a time to make a nice stiff meringue. It is important to do it SLOWLY, otherwise you will get a sad meringue! Stop the mixer when it is a stiff meringue, then fold in the dark chocolate, balsamic vinegar and cocoa powder. Line a baking sheet, personally I like an individual pavlova that is the perfect ratio of crispy on the outside and chewy on the inside. 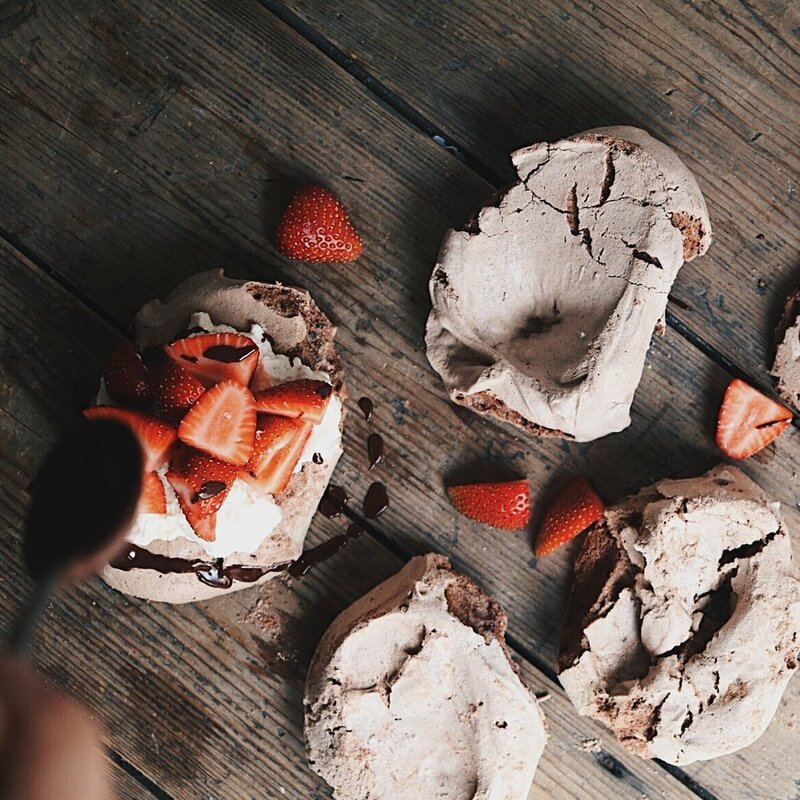 To get the shape, grab a large spoon and dollop a spoonful on the baking sheet, then with a small spoon sweep a little divot into the meringue so it can hold all the strawberries. Spoon the other meringues onto the baking sheet being careful to not get them too close to each other. Place in the oven and turn it down to 150. Bake them for 45 minutes for the perfect meringue, if you play with the size of the meringues be careful to keep an eye on them in the oven and adjust the time accordingly. Meanwhile in a clean bowl place the cream, icing sugar and a scraped out vanilla pod and whip it, ‘whip it real good’! I like a soft whip personally, but each to their own! Strawberries. Top the strawberries and cut to desired size, place into bowl with the caster sugar and vodka. Give them a good mix around to get the juices flowing. To make the dish extra indulgent, chocolate sauce is needed. Over a bain marie, melt the chocolate and whisk in enough boiling water to loosen the chocolate to make it perfect for drizzling. Once the Meringues are out of the oven and cool, it’s the fun bit, putting it all together. Place Pavlovas onto desired plate, plater or table. Dollop on the cream, scatter the strawberries and drizzle the chocolate.